Few names are more optimistic than Casino of Dreams. With the amount of choice there is available online, coming in with such a claim is a risk at best, at worst it is a serious mistake. The fairly basic and unimpressive design concept is not a good start to backing up the boast brought forward by the title. Simple blues, a fairly attractive logo, and very little else is what greets you on first visit to the site. But appearance is not necessarily the most important feature. There are sites around that don’t look great, but turn out to be amazing, so perhaps there is hope for Casino of Dreams, but that depends on the choice of promotions and games on offer. For slots players there are some treats here, popular TV and film themed slots such as Tomb Raider and Bridesmaids are available amongst a collection of over 120 video slots. There is a good selection of 3-reel slots available here as well. However, if you’re looking for those favourites that are the feature of so many sites, you won’t find them here. 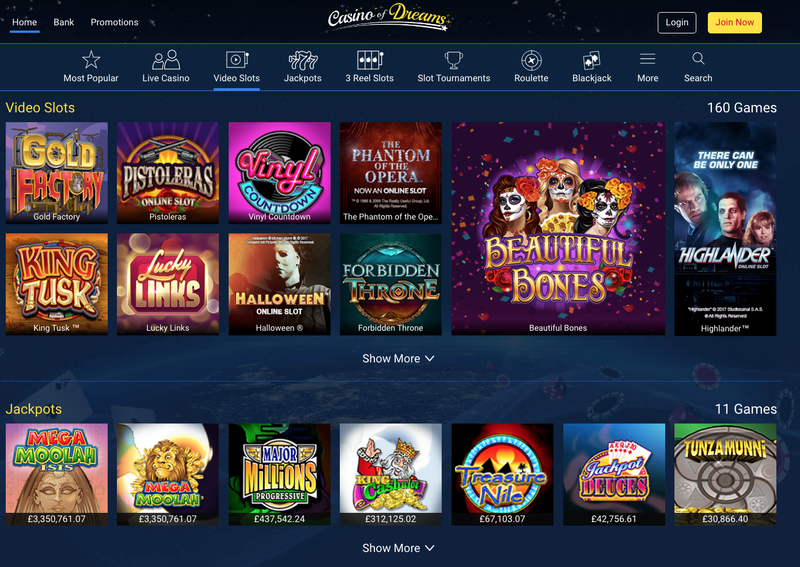 This isn’t always a problem, if a site brings something new for you to experience, but Casino of Dreams, for the most part, just offers the less popular choices from other sites. Blackjack, poker, roulette, craps, baccarat and other table games are available if this is your interest, but there is no live casino. There is however a host of video poker games, which is probably the most interesting gaming experience on offer.